If you were Predators GM David Poile, you would have a sense of urgency too. The Predators were arguably the biggest buyers at the seemingly quiet NHL trade deadline today, bringing in forwards Paul Gaustad and Andrei Kostitsyn in two separate deals. Kostitsyn was acquired from Montreal in what was the first announced trade of the day. The Predators sent away their 2013 2nd round draft pick and a conditional 5th round pick in 2013 that they had originally acquired in the trade that sent Hal Gill to Nashville earlier this month. Kostitsyn, 27, has posted 12 goals and 12 assists in 53 games for the Canadiens this season. In 41 career playoff games, Kostitsyn has 11 goals and 8 assists for 19 points. The biggest motivation for making this trade may stem from the success of Andrei’s brother Sergei, who plays on the Predators’ top line with Mike Fisher and Martin Erat. Sergei currently has 15 goals, which ranks third on the team. Last season, he led the team with 23 goals. Like his brother, Sergei was acquired in a trade with the Canadiens. He was acquired in a three-player deal on June 29, 2010. “It worked out with Sergei and we are hoping it will work out with Andrei as well,” added Trotz. Gaustad was acquired less than three hours after the Kostitsyn trade was announced. The Predators also received a 4th round draft selection in 2013, while sending their lone 2012 1st round draft pick to the Buffalo Sabres. The 30-year old Gaustad has 7 goals and 10 assists in 56 games for Buffalo this season, while also accruing 98 hits and 40 blocked shots in that time. 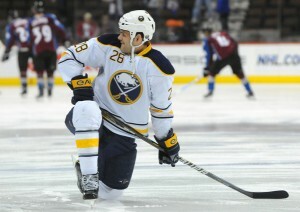 Gaustad also ranks tenth in the league in face-off percentage, averaging 56.8%. Gaustad is primarily a penalty-killer as well as a top-center in regard to defensive zone face-off situations. His 6’5” 220 lb. frame helps him muscle his way through important defensive situations. The critics have already come out full-circle on both trades. Most have said that Poile overpaid for Gaustad. Here is why those critics are incorrect. The Predators have a “win now” mentality. The team had to make some additions up front to get past the NHL quarterfinals and beyond. Why? This summer is going to be one of Poile’s toughest since starting with the Predators in 1998. Here is the list of players that are set to become free-agents on July 1. *Recently acquired. **Eligible for arbitration. There are three inarguable elite players on Poile’s roster – goaltender Pekka Rinne and defensemen Shea Weber and Ryan Suter – two of them are eligible for free-agency. Shea Weber and the Predators signed a 1-year deal through arbitration last season. Let’s look at the business side of things, shall we? Forbes Magazine ranks each NHL club in terms of value – judged mostly by their revenue versus their operating income from the past season – and the Predators sit 25th in this year’s edition. While they saw about $42 million in revenue, the operating costs just deplete that number. The big-market teams, such as the Toronto Maple Leafs ($193 million revenue), New York Rangers ($169 million revenue) and the Montreal Canadiens ($165 million revenue), can afford and retain big-name players a lot easier. Shea Weber and Ryan Suter have proven themselves to be cream-of-the-crop defensemen in this league. The total cap hit for Nashville this season is $51.327 (about $12.973 under the NHL salary cap), which is about the area that owner Thomas Cigarran would likely want to stay. Both Weber and Suter will demand salaries worthy of top NHL defensemen. Complain about team loyalty all you want; they deserve what a big-market team would be willing to pay them. The Predators want a deep playoff run this season not to just win the franchise’s first Stanley Cup, but to help build revenue to help fill the inevitable void that Weber or Suter are going to leave. This franchise will survive in Nashville no matter what the case may be (just go to a game at Bridgestone Arena and find out for yourself), but being a Stanley Cup contender is something that does not last forever. David Poile knows this and is making the best out of a raw situation. The acquisitions of Andrei Kostitsyn and Paul Gaustad have helped fill roster depth and will make Nashville a team to be reckoned with in the 2012 Stanley Cup playoffs.